Learning to ride a horse can be very exciting, but there are several things you don't want to do the first time you are in the saddle. There's a reason why equestrian clothing, both English and western is form-fitting and trim. Flowing scarves, baggy pants, bulky sweaters with loose waists, and other sloppy or loose clothing can get caught on the saddle if you should fall off. Getting caught half-way down means you could get dragged, and that is far more dangerous than falling clear of the horse. Be sure to determine what appropriate riding clothing is right for you. Of course, you want to stay on the horse and not fall off. However, it's a big mistake to tie yourself to the horse, or to the saddle or reins in any way. If you do fall off, you want to fall free. This lessens your chance of getting dragged, which could result in far worse injuries than just hitting the ground. The reins help you control the horse. If you get scared, your reaction might be to toss the reins and hold on for dear life. This could actually confuse and frighten your horse, especially if you lean down and grab it around the neck. Even if you are scared, hold onto those reins, and listen to what your guide or coach is telling you. When it feels like things are going wrong, don't panic, take a deep breath and do as you're told. Flip-flops, sandals, heels, trainers, clunky hiking boots, and other inappropriate footwear can lead to disaster if they slide through or get wedged in a stirrup. The first time you ride, try to find footwear that is as close to a riding or cowboy boot as possible. That way, you are less likely to get caught in a stirrup if you fall off. You don't want to hit the ground with your foot wedged in a stirrup. Many people think that riding is just a matter of having the horse just carry them around and all they have to do is just sit there. But, riding is much more than just sitting in the saddle and letting the horse do all the work. 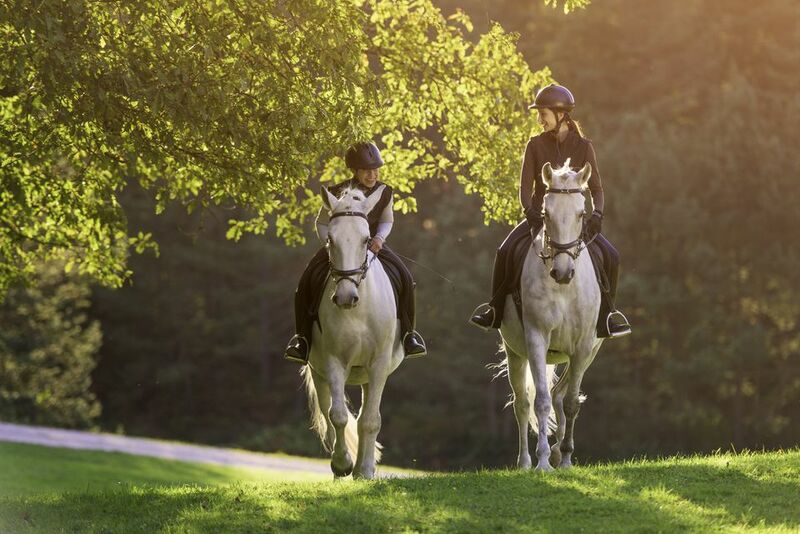 Riding is an activity that requires practice, skill, coordination, and balance. If you're taking a lesson or going out on a guided tour, it's really important to listen to what you are being told. If your coach tells you to ride the bay horse, but you think you'd like to ride the pinto, keep in mind that the coach probably has a reason for picking that horse for you. The other horse may look like it's giving its rider a really good ride, but that may be because that rider already knows how to get the best out of the horse because they're a bit more advanced. Coaches are good at matching riders with horses. So while it's fair to ask, "maybe one day, can I ride that one," for now, trust the coach's choice. Saddles and stirrups make sitting on a horse more comfortable, and aid in helping the rider keep their balance, but they shouldn't be used to help you hold on. It can turn into a bad habit, and if you really do start to fall, holding onto the saddle may shift it to one side. Holding on tight as it turns could result in you just getting dragged, rather than falling clear of the horse. Good riders know how to shift a saddle back into place if they feel it turning, but you won't know how to do that on your first ride. Instead, if you are a feeling unsteady, grab the horse's mane if you must, or the strap that your coach can put around the horse's neck for that purpose. Even if the horse never moves or travels faster than a walk, always wear a helmet. 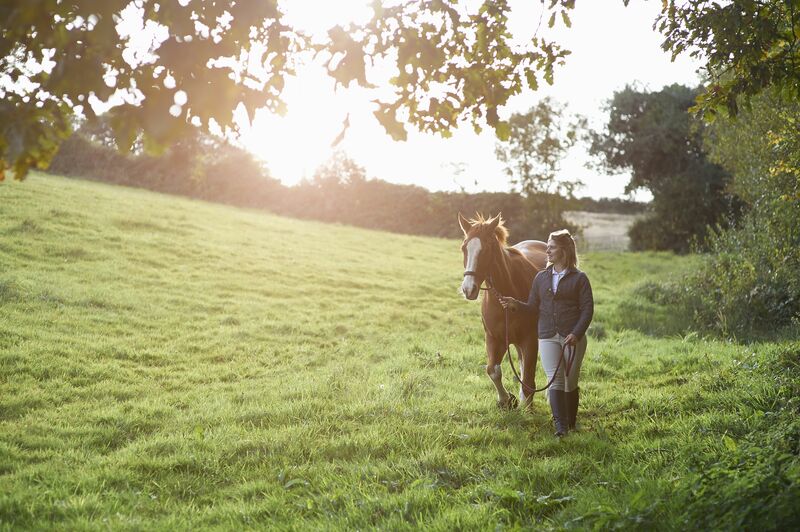 After your first ride, you're going to realize that riding is much more than just sitting there. You're going to have some sore muscles, and you may feel confused about some things. That's because you've used your body in a way it is not accustomed to. When it comes to horses and riding, learning is a life-long journey. Don't be discouraged if you weren't able to ride off into the sunset the first time out. Like any skill, regular practice will increase your knowledge and ability.